01 New Honda Civic Find a new sense of style with the new Honda Civic. 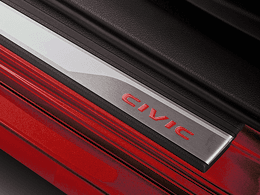 This modern hatchback flaunts a unique profile and has a range of state-of-the-art driving features and intelligent technologies to provide a Honda drive like never before. 02 Exterior design Muscular and sporty, the new Honda Civic is a five-door hatchback designed to make an impact on the roads. The shouldered bonnet is counterbalanced by razor-sharp LED headlights and a wide-set split black grille, with honeycomb features on the lower bumper for an athletic finish. Contoured lines on the lower sides fall back to a structured rear and roof spoiler, creating an aerodynamic and sleek stance. 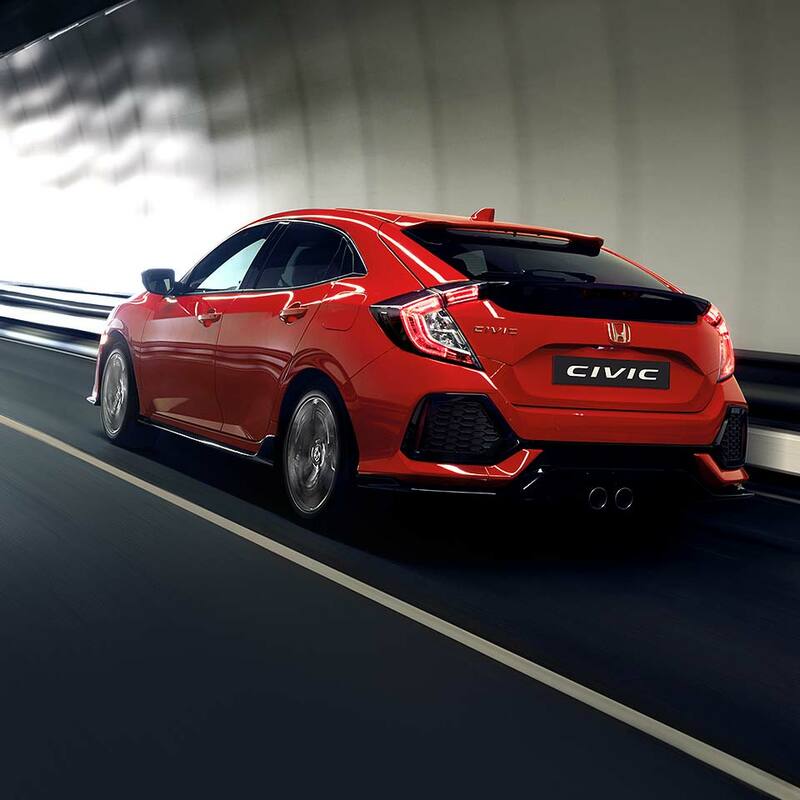 Twin centre exhaust pipes feature on the Civic Sport, clearly displaying its strong performance. Select the model you like the most with a variety of luxurious body colours such as Crystal Black Pearl, White Orchid Pearl, or Rallye Red. 03 Interior style The Honda Civic displays its sporty character within the car, with a red or blue illuminated dashboard and leather trims, as well as aluminium pedals and carbon effect detailing for the ultimate style statement. Enjoy a spacious boot with 60:40 split folding rear seats for all of those life adventures. Feel relaxed and at prime temperature with dual-zone climate control, as well as the luxury of heated front and rear seats in the higher trims. Upgrade to the Prestige for chic and comfortable full leather upholstery. 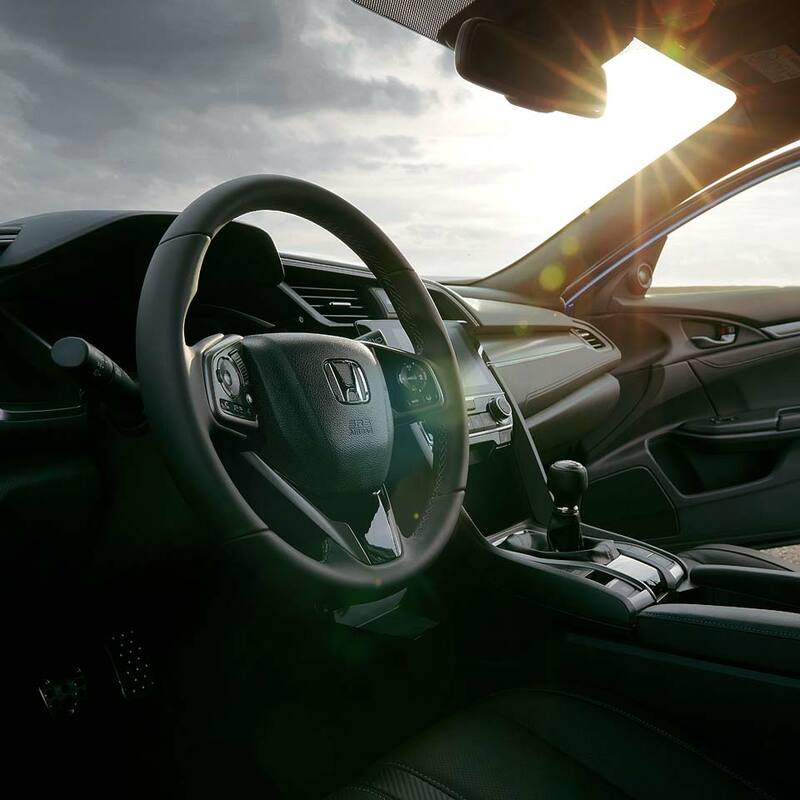 05 Safety & technology Enhancing your everyday drive, the new Honda Civic boasts a range of intelligent new safety features, as well as standard active and passive safety features to ensure complete peace of mind on the road. Driving on the motorway is now easier and safer than ever with Lane Departure Warning, Blind Spot Information and Lane Keeping Assist, to ensure you do not drift into another driver’s path. With the Collision Mitigation Braking System, you are prevented from hitting pedestrians as well as other vehicles when driving, while the Cross Traffic Monitor helps you when reversing. Benefit from the electronic parking brake for easy and safe parking in all spaces. There is a seven-inch CONNECT touchscreen infotainment system for total ease and control of music and convenience tools, such as the DAB digital radio, satellite navigation and phone connectivity. 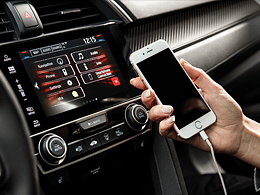 CONNECT is compatible with Apple Carplay® and Android Auto®, where you can make calls, listen to music or send and receive messages. For a true surround sound experience, you can enjoy 11 speakers in the Ex trim, and eight speakers in the Sport trims.